Meet Ei Yin Mon, a factory worker in Myanmar. She came to Yangon after cyclone Nargis hit the country in 2008. The base wage she earns is extremely low, so she has to work many hours of overtime to compensate. “We are always being told to work faster. They think that we are like animals. I know I have no rights to make a complaint, so I have to bear it”. Many workers globally face similar challenges and are trapped in poverty. They often have many mouths to feed, with too little revenue coming from regular working hours and must either compensate by working overtime or fall into debt. Sometimes workers don’t get paid at all and do not have access to grievance mechanisms to address this. According to the Universal Declaration of Human Rights, a living wage is a human right. The Declaration points out that everyone who works has the right to just and favorable remuneration ensuring for himself and his family an existence worthy of human dignity, and supplemented, if necessary, by other means of social protection. The ILO recognizes living wage as a basic human right as laid out in the Universal Declaration of Human Rights, through the ILO Convention concerning the Protection of Wages of 1949 (95), and the ILO Convention on Minimum Wage Fixing of 1970 (131). It also refers to it in its Constitution and in the 2006 ILO Tripartite Declaration on MNE’s. These two pillars of international instruments (the Declaration of Human Rights and ILO standards) have formed the basis for the recommendations towards MNE’s concerning living wage as laid down in the OECD Guidelines for Multinational Enterprises since its revision in 2011. The OECD Guidelines are the most comprehensive standard for Responsible Business Conduct (RBC) covering all areas of corporate responsibility, ranging from labor and human rights to environment and corruption. Currently, 46 countries adhere to the Guidelines. These governments made a legally binding commitment to set up National Contact Points to promote corporate responsibility and to handle complaints about corporate (mis)conduct. Although the Guidelines are not legally binding for enterprises, they represent a “firm government expectation of company behavior” and have been endorsed by business and civil society. The 2011 revision of the Guidelines has been important for the integration of the concept of living wages in various ways: firstly, it has resulted in the inclusion of a recommendation on living wages in Chapter V on Employment and Industrial Relations. The OECD Guidelines state that: “when multinational enterprises operate in developing countries, where comparable employers may not exist, (they should) provide the best possible wages, benefits and conditions of work, within the framework of government policies. These should be related to the economic position of the enterprise, but should be at least adequate to satisfy the basic needs of the workers and their families.” Secondly, during the 2011 revision of the OECD Guidelines a chapter on human rights was added which, as noted, includes the concept of a right to a living wage. Thirdly, the 2011 revision of the Guidelines introduced a concept of supply chain responsibility for companies. Among other things, this means that enterprises should avoid causing or contributing to the non-respect of living wages within their own operations as well as seek ways to prevent or mitigate adverse impacts with regard to insufficient wages linked to their operations, products or services by a business relationships, even if they do not contribute to those impacts. In other words, enterprises are expected to make an effort vis-à-vis their suppliers to have living wages respected. While the 2011 revision of the Guidelines introduced new expectations of enterprises it also equipped them with tools to respond to these expectations and manage risks by carrying out due diligence on their business operations and suppliers. The process of due diligence consists of three parts, identification of (potential) adverse impacts, prevention and mitigation, and accounting for how adverse impacts are addressed. Due diligence processes are meant to be reasonable, the appropriate response to living wage issues will thus vary according to a company’s relationship to adverse impacts. The challenges for individual companies are numerous, especially in situations where, in the supply chain, payment of below living wages is pervasive and perceived as necessary to maintain competitiveness. In such a context, how should enterprises apply leverage and take appropriate steps that are expected by internationally recognized standards? First, a good understanding of responsibilities at the company level is needed. Companies should be aware of their individual responsibilities under internationally recognized standards of the ILO, the OECD and the UN concerning wages in their supply chains. With the help of OECD’s sector guidance on due diligence, for example, companies should carry out due diligence, use their leverage and take steps in their supply chain to promote living wages. These new responsibilities should also be reflected in sector codes of conduct, of which many currently ignore the tricky issue of living wage. Better information about the business case for taking these actions with respect to risk management, reputation and productivity, would encourage enterprises to act more responsibly. Apart from ethical considerations, there are many reasons why it makes business sense to strive for payment of living wage throughout the value chain. Paying relatively low wages may lead to costs for businesses such as lower product quality, lower worker productivity and few investments in innovation due to high labor-turnover. Below-living wage payments also increase the risk of labor unrest and may lead to the disruption of operations and reputational damage to companies, particularly in the present age of mass communication. Second, business and governments would gain from more coherence and fine-tuning of the methodologies and definitions concerning living wage. Currently a common methodology for calculating living wages does not exist. Ideally MNEs could rely upon one broadly accepted methodology which takes into account local conditions to determine what living wages should be, as well as the notion that wages should be regularly adjusted on the basis of negotiations with social partners. Third and most importantly, a sector-wide comprehensive approach is needed. Focusing on calculating the numbers and levels of wages alone will not do the trick. Even if a jump to provision of living wage levels could happen overnight, in many regions this might damage the competitiveness of factories or suppliers, potentially squeezing them out of the market and leaving many workers jobless. In order to achieve living wages in a sustainable manner a comprehensive approach is needed that brings together the largest number of possible of social partners and stakeholders so as to create a level-playing-field. Most of the initiatives that have been successful in targeting living wage issues bring together several stakeholders. They are motivated by the need to act together and create a level playing field, not only among some enterprises and their suppliers, but in the whole sector. Some examples of these include ACT (Action, Collaboration, Transformation), a global framework on living wage that brings together all relevant stakeholders in the textile and apparel sector, as well as the Malawi Tea 2020 Revitalization Program under which tea producing companies, tea buying companies and retailers, standard and certification organizations, and tea trading companies have signed and MOU pledging to respect living wages. These initiatives are to be praised for having paved the way forward in a new and challenging territory. However, to be really effective, these initiatives will need to be scaled up dramatically to reach other sectors and geographical areas to create a level playing field for sustainable living wages. Ensuring the payment of living wages throughout global supply chains will be a significant challenge. However, doing so will be necessary to achieving the Sustainable Development Goals and responding to expectations of international standards of human rights and responsible business conduct. Even if individual companies play a considerable role in this, they cannot solve this issue on their own. For one thing, (local) governments, who have the duty to protect and fulfill human rights, and ensure access to effective remedy, should be there to support them and contribute to creating the right conditions. Ideally, however, the way forward is to engage in sector-wide collaboration with suppliers, trade unions, governments, NGOs and employers’ organizations. Some promising initiatives have already been launched, such as the ACT process and the Malawi Tea MOU, or the Action Plan on Living Wages. The companies involved in these efforts deserve praise for their participation. But in order to achieve a true level playing field, the world’s remaining multinationals, some 80, 000 companies, will also need to take action and efforts will need to be scaled up and sped up dramatically. The worker’s name was changed to protect her anonymity. See Cascio W.F, The high cost of low wages, Harvard Business Review, December 2006; and Zeynep T., The Good Jobs Strategy: How the Smartest Companies Invest in Employees to Lower Costs and Boost Profits– Amazon Publishing, 2014. Six years after the start of the financial crisis, employment still hasn’t got back to pre-2007 levels in many countries, and for many people working conditions have got worse, according to the OECD’s Employment Outlook 2014, released today. Talk of ‘sovereign defaults’ and the whole system unravelling has faded, but – at a personal level – the conversation of the Great Recession has become one about job loss amongst family and friends, cutbacks at work, falling wages, under-employment, insecurity, and what this means for simply trying to make ends meet. Although the average unemployment rate in the OECD countries finally fell from 8.5% at the peak in 2009 to 7.4% and is predicted to continue to drop slightly throughout 2015, almost 45 million people are still recorded as unemployed, plus an unknown number who’ve disappeared from the unemployment statistics because they have given up looking for work. And the number of people suffering from long-term unemployment (12 months or more) has nearly doubled since 2007, reaching 16.3 million across the OECD countries in total. Unemployment is not the only concern. Many of those who kept their jobs have also encountered more difficult times. For this reason, the Outlook investigates how the crisis has also influenced working conditions including earnings, security and job quality (measured along three dimensions: the level and distribution of earnings; employment security; and the quality of the work environment). Real wage growth has slowed, or even dropped, as a result of rising unemployment and policies that reduced or froze public sector earnings as a part of fiscal consolidation efforts. The downwards adjustment in wages has helped to improve competitiveness, rebalance current accounts and promote growth. But real wages have fallen harder than expected in some, mainly European, countries. With wages cut, people can’t purchase as much as they used to. With inflation close to zero in some countries, cutting wages further means cutting “nominal” wages: people will actually get less cash from one month to the next. The Outlook argues that wage moderation and even real wage cuts were probably needed in some countries, especially in the Eurozone, to restore competitiveness lost prior to the crisis, when wages grew more rapidly than productivity and countries accumulated large current account deficits. But there comes a point where further cuts don’t create any more jobs, but do create more hardship. What is more, wage cuts only make sense if they lead to lower prices as well. This hasn’t always happened, so policymakers need to make sure that firms don’t just hoard all the savings from lower wages, but pass them on to consumers. A big concern is the loss of income low-paid workers and their families have suffered as a result of slower wage growth or wage cuts. The Outlook advises countries to look at who will be hit hardest, and who can least afford, wage adjustment in their future policies. Implementing or strengthening mandatory minimum wages, progressive taxation and in-work benefits would help protect those more vulnerable workers. Non-regular employees, whose work contracts are not ‘permanent’ or ‘open-ended’ (so called “atypical” jobs), are at greater risk of under- or unemployment than regular employees. Yet unfortunately, these types of contracts are becoming more common. While there are some benefits to non-regular employment, such as increased flexibility, they don’t always outweigh the negative consequences. Contrary to belief, “atypical” jobs are not an automatic stepping stone to permanent work. In Europe, fewer than half of temporary workers actually moved into a permanent contract three years later and in countries like France, Italy or Spain the proportion is around 20%– too often, they either get pushed out of the workforce, or continue with a sequence of short-term contracts. One reason for their lagging behind is that temporary employees of similar ages and with similar skills are 14% less likely to receive employer-sponsored training than their colleagues with permanent contracts. Countries are encouraged to reduce the large gap that exists in some countries between the employment protection of permanent and temporary workers which would help reduce the reliance by employers on temporary work. Continuing the current trends of increasing non-regular employment, with worse conditions, could lead to a decrease in human capital as skills are not developed. Some countries have already initiated reforms which effectively give non-regular employees greater protection relative to permanent workers or reduce use of such contracts, and other governments are urged to follow suit. The crisis has also deepened the problem of poor job quality. The groups who accumulate the most disadvantages are youth, low-skilled workers and temporary employees. Of the three, low-skilled workers are the most likely to be pushed into unemployment. Almost one in four low-skilled workers reports experiencing too many challenges at work and too few resources to cope. The Outlook suggests several actions to improve job quality. Stronger training programmes, for example, would help employees to better handle their job demands, as well as prepare supervisors with better management practices. Countries should also implement labour market policies that facilitate mobility between sectors and foster job creation. Fortunately, policymakers don’t have to choose between job quality and the quantity of jobs: several countries have proven that it’s possible to succeed in increasing both. With so many challenges in the labour market, what can today’s employees and future employees do to better their own chances? Various skills and factors influence a person’s employment status and salary. Early on in a career, the field-specific skills gained from studying matter more. But later on, more generic skills have a stronger impact on hourly wages. For young people, education is the biggest cause of differences in hourly earnings. Experience also plays an increasingly significant role in explaining wage variation among youth. And although the evidence suggests few young people seem to combine work and study, securing some work experience even before finishing studies is shown to help land that first job. The Outlook identifies a role for policymakers and employers here, and highlights how programmes that provide work-experience are essential to ensure economic recovery. Policymakers and employers should identify the benefits of work-study programmes and take note of best practices. After all, investments in youth can help secure the future prosperity and well-being of nations. Do workers reap the benefits of productivity growth? Few findings from our recent work at the Resolution Foundation are more worrying than those that suggest a weakening of the relationship between economic growth and gains for ordinary workers. In the last twenty years of the 20th century, each pound of UK GDP growth was accompanied by around 90 pence of median wage growth. From 2000 to 2007 that figure fell to just 43 pence. This bears worrying similarities to the experience of the United States; with US median wages now flat for a generation, the pay of Americans in the bottom-half has decoupled from productivity growth. A new report from the Resolution Foundation by Professor John van Reenen and Joao Pessoa of the London School of Economics looks at how the relationship between productivity and compensation for workers has changed in the UK and in the US, building on similar work carried out in the US by Jared Bernstein. The report defines two types of decoupling, each of which tells a very different story. For “net decoupling”, defined as the relationship between productivity and average hourly compensation, compensation for ordinary workers has not fallen behind productivity, just as economic theory would predict. The only explanation for the two diverging would be if labour’s share of national income fell versus the capital share. While others have suggested that just such a decline has taken place, Van Reenen’s results suggest it has not. In the second type of decoupling— “gross decoupling”—the measure of productivity used is GDP per hour worked in the UK economy. But this time worker benefits are represented by median hourly earnings. Using this measure the picture looks very different. 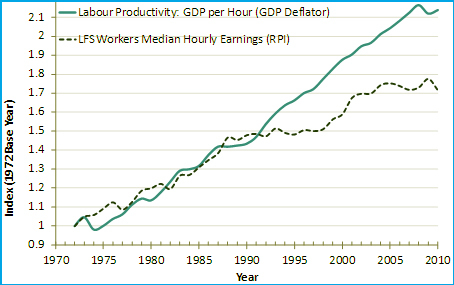 Median pay has diverged markedly from labour productivity in the UK in the last twenty years. In other words, the pay of ordinary working people has not kept pace with the average value of output that workers produce. So what’s the difference between the two types of decoupling—and which one should we care about most? The answer lies in three differences between the two measures used to represent the benefits that accrue to workers. First, net decoupling is based on an average measure rather than a median. As a result, it captures the total compensation going to workers in the economy divided by the number of hours worked (rather than the hourly wage of the middle worker). As an average, this measure is therefore pulled up when pay grows very strongly at the top, just as it has in the UK in the past ten years. Second, net decoupling looks at total compensation rather than just wages. This means it includes things like employer pension contributions and employer National Insurance Contributions. As such, there’s a reasonable argument that it’s a better measure of the complete rewards derived by workers. And, again, recent years have seen a widening gap between these two measures. As non-wage aspects of compensation have grown significantly, compensation has grown faster than wages. The third difference, and the most technical, is that the two measures are calculated using different inflation indexes. The first, used for net decoupling, is calculated using the GDP deflator, while the second uses the Retail Prices Index (RPI). What’s the difference and which one is right? The answer is that it depends what you’re analysing. If you want to compare productivity and pay fairly you should use the same deflator for both—that is, the GDP deflator. But if you want to know how the purchasing power of pay is changing over time, you want to use the RPI. These two measures have moved apart very slightly in recent years, but the implication of this change for living standards is hard to interpret. You might say these are just arguments over definitions without much bearing on policy debates. It’s true that their significance rests very heavily on interpretation. Broadly speaking, there are two ways of thinking about this. On the one hand, we could find Figure 1 reassuring. It confirms the theory that, over the long-term, productivity should track average compensation. In fact, looked at this way, we might even think Figure 2 is simply wrong; once we use the “right” measure of the benefits accruing to workers, as theory dictates, the decoupling turns out to be a phantom. This argument is not without merit. It’s fair to say, for example, that total compensation is a more complete measure than wages. But what if we look at the question another way, from the viewpoint of a worker in the bottom half of the earnings distribution? Looked at this way, the question that matters for living standards is not which measure should theoretically track productivity, but which most accurately captures how well off people feel, and whether we’ve seen a change in the relationship between that measure and output, our central indicator of economic health. Saying that decoupling is just a statistical quirk of using the median rather than the mean doesn’t make it less of a problem that the wages of low paid workers in the UK are stagnant and no longer tracking productivity in the way they used to; it just helps to explain why life now feels particularly hard in the bottom half and—in the run up to the crisis—particularly out of step with an ostensibly sunny economic climate. Likewise, the growing gap between wages and compensation doesn’t make the stagnation of pay packets any less real, it just helps to explain that stagnation. As Jared Bernstein pointed out in a seminar to discuss Van Reenen’s results: whatever the theory says, if workers weren’t getting better off over time even when the UK economy was growing and productivity was rising, we have a problem on our hands. It’s important that we better understand what sits behind this trend. The Resolution Foundation report shows that that inequality has played a big role in the decoupling of median pay and productivity. So has growth in non-wage compensation. We need to ask which of these trends represents a price worth paying and, for those that don’t, how we can avoid a repeat of the past. Only then will we bring into focus one of the most important aspects of the crisis now facing living standards: the fraying of the golden thread that joins pay and productivity, which for much of the twentieth century helped pull prosperity to unprecedented highs. Less income inequality and more growth – Are they compatible? Is wealth a matter of luck? Seventy million pounds – or about $114 million: That’s how much you now need to get on to The Sunday Times “rich list” (subscribers only) in the UK. A pretty steep entry barrier and, perhaps surprisingly, it’s even higher than it was before the crisis: Just three years ago, a mere £55 million would have won you a place among the UK’s wealthiest. That’s further evidence that the gap between the incomes of the richest and the poorest is widening. But as a recent OECD paper demonstrates, it’s not happening just in the UK. Income inequality has risen in all but a handful of OECD countries, says the paper, which offers preliminary findings ahead of a fuller report later this year. On average, the richest 10% of people are about nine times better off than the poorest 10% in OECD countries, a ratio of 9 to 1. The gap is lower in Scandinavian countries – about 5 to 1 – but higher elsewhere: 14 to 1 in Israel, Turkey and United States and 27 to 1 in Mexico and Chile. “With very few exceptions (France, Japan and Spain), wages of the 10% best-paid workers have risen relative to those of the 10% least-paid workers,” says the paper, and “top earners saw their incomes rising particularly sharply”. As we noted recently on the blog, the trend is for the gap to grow, and “even in highly egalitarian places like Scandinavia”, as The Economist points out. One way to understand this is through the Gini coefficient a “measure of income inequality that ranges from zero, when everybody earns the same amount, to one, when all income goes to only one person”, as The Wall Street Journal explains. By that measure, income inequality in OECD countries has risen from 0.28 in the mid-1980s to 0.31 in the mid-2000s – an increase of 10%. The rise is often blamed principally on a mix of globalization, which has led to a decline in manufacturing jobs in developed countries, and the emergence of the knowledge economy, which rewards people with higher levels of education. The OECD paper acknowledges that technological progress and globalisation have had an impact, but that their role has perhaps been overstated. It’s true that increased trade – a characteristic of globalization – has put pressure on the wages of lower-paid workers. But some of these downsides have probably been offset by rising capital flows – another feature of globalization – most notably a big increase in foreign investment. Instead, the paper suggests the role of other factors may have been overlooked, notably the changing nature of taxes and benefits – in effect, the money governments collect in taxes and social security contributions from workers and then redistribute, directly and indirectly, as benefits to people in need. This system of redistribution reduces income inequality by a quarter in OECD countries, and by even more in some countries. But, the paper suggests, its impact has weakened over the past 10 to 15 years. And there’s been a change in who we marry: “Over the years people have become more and more likely to marry mates who have similar incomes,” says The New York Times . By contrast, when richer and poorer people wed, it tends to spread out the benefits of higher incomes more widely in society. So what can be done? OECD Secretary-General Angel Gurría clearly believes action is needed: “Halting the scary outlook of increasing inequality is more urgent than ever,” he said at a recent OECD policy forum devoted to the issue. Based on its examination of the causes of rising inequality, the OECD paper suggests taxes and benefits may need to be looked at again, especially in light of the fact that “the share of overall tax burdens borne by high-income groups has declined over recent years”. Action is also needed to ensure that people who aren’t currently working can find jobs, but “this requires not only new jobs, but jobs that enable people to avoid and escape poverty,” the paper says. And, it concludes, there needs to be a stronger focus on better training and education for low-skilled workers. The only time I’ve had more money than I could spend was in Warsaw in the 1980s. You had to change a certain sum from hard currency into zlotys for each day on the visa, and though I like a nice tin of sardines or an attractive wood carving as much as the next man, the thrill starts to fade after a while. So there we were on the night before we left, rushing round the shops at closing time trying to convince ourselves that a dozen AC/DC transformers would make an ideal gift and that you can never have too many hammers. Our other memorable shopping experience had been taking turns with our Polish friends to wait in a queue all afternoon to buy meat. Since then of course, Poland has been transformed out of all recognition, and joined the OECD in 1996. The queues have gone and living standards have been rising steadily. The latest ILO report on global wages doesn’t show the difference between the 1980s and now, but even taking 1999 as a baseline (= 100), real wages in Eastern and Central Europe rose by over half in the past ten years (index =161). For Eastern Europe and Central Asia, the rise is even greater, at 334, although for many of the countries included, this is because the baseline is so low. There was less progress elsewhere, especially in the advanced countries (index = 105) and Latin America and the Caribbean (index = 114). This positive trend doesn’t tell the whole story however. The crisis cut growth in global wages by half in 2008 and 2009, and the report also shows that the proportion of people earning low pay – defined as less than two-thirds of median wages – has increased since the mid-1990s in more than two-thirds of the countries for which data are available. In countries with a high or growing share of low pay, the probability of moving into better-paid jobs remains low, and the risk of being trapped into low-paid jobs is high. The report also argues that discrimination is partly to blame for the persistence of both low pay and wage gaps. In both industrialised and developing countries, low-paid workers tend to be young, are disproportionately female, and are more likely to be members of a disadvantaged ethnic minority, racial or immigrant group. The ILO also note that amount of national income going to paid labour (wage share)has been declining since the mid-1980s in OECD countries as a whole, although with significant fluctuations over time and among countries. Apart from a redistribution from wages in favour of profits, there has also been a redistribution from median earners to high-wage earners. Not surprisingly, the ILO is worried about “social tensions” that could arise due to another widening gap: that between those who caused the crisis and are now doing well again, and those who paid for it and see little hope of improving their lot.